As you stroll up and down the isles at the supermarket filling your grocery cart, you are armed with everything you need to make sure you choose your items wisely. Making good, healthy choices is the very reason you carefully put together your shopping list the night before. Now, you know that most of the snack food items are taboo and should be off limits, but maybe you could take a walk down junk food lane on the off chance you might find something acceptable to munch on later. Upon reading food labels, when you see the words low fat or fat free, your brain automatically gives you the go-ahead because these foods can’t make you gain weight, right? But, is that really all there is to it, or is there more here than meets the eye? According to studies, Americans eat around 49,000 extra calories every year which translates into a grand total of 14 extra pounds of body fat per year. This is why an estimated 65% of Americans are considered overweight. In essence, Americans are slowly getting fatter and it is largely from the consumption of fat free foods. The problem is, while fat free foods contain no actual fat, many of them do contain high amounts of sugar. It is all this sugar that has been added to these products that allows them to be called fat free. Consuming high amounts of sugar will cause you to gain weight because sugar makes your blood sugar levels rise rapidly, causing a large insulin response. Insulin, particularly in high amounts, will transport much of this sugar right to your fat cells for storage. With this in mind, is there anything you can do to prevent yourself from being lured into the labeling web of deceit? Here are some things that will help clear up the blurriness of labeling reading so you can have a more clear view of what is really in there. To start with, always read everything on the label. Do not just look at the fat content then only skim down at the rest. Look at the sugar content and compare it to the overall carbohydrate content to see how much of the carbohydrates are actually sugar. Also important is to look for the fiber content of certain foods. When you buy breakfast cereal for example, make sure it has at least 5 grams of dietary fiber per serving. Also try to buy whole grain items like whole wheat bread and whole wheat pasta as these also provide decent amounts of fiber. Aside from reading the labels, you should also read the list of ingredients. Here is where you get to see what is actually in each item. When buying any flour items such as bread or pasta, avoid anything with the words enriched, bleached, or white flour in the ingredients. The more enriched a product is, the less nutritious it is. White flour has a very high sugar content and therefore is not the best choice. Look for items with whole wheat flour instead. One thing that gets hidden in the list of ingredients that you really need to be aware of is the trans fats. These trans fats are cleverly disguised with the words hydrogenated vegetable oil. These are oils that the manufacturer adds hydrogen to in order to transform them from their liquid form to a solid form. These fats are more dangerous by far than saturated fats and you know how bad saturated fats are. If you see the key word hydrogenated anywhere in the ingredients, put it down, back away slowly, then turn, run, and dont look back! 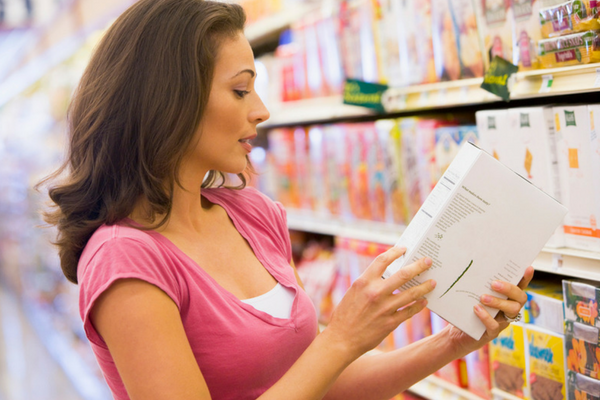 Always remember to read everything on both the nutrition label and the list of ingredients before buying an item. Never let yourself be fooled into thinking an item wont make you gain weight by the words fat-free so boldly displayed on the front of the package. It is this kind of deception that has been the cause of unwanted weight gain throughout the nation. Remember, the FDA requires all food manufactures to disclose everything in their products to you, but it is ultimately up to you to read far enough to find it all.